tended to be written by the same people who had written superheroes just a few years earlier made it likely some schticks would carry over from one genre to the other. The Apache Kid went beyond the mere secret identity, by posing as an Indian — which was relatively easy for him, since he'd been raised in their culture. His original name was Alan Krandal, and he was every bit as Caucasian as the next settler's kid. But he'd been orphaned and adopted into a different enthnicity, like White Boy and Superman before him, and grew to manhood under the care of Red Hawk, an Apache. As an adult, he assumed the name Aloysius Kare, and rejoined the society of his birth. But he maintained a presence in he other, by creating the "Apache Kid" persona. As the Kid, he was regarded as a good guy in both worlds, so he could serve as a liason between them. More important, he could pursue his foes wherever they went, on either turf. Both sets of associates called him "Apache Kid", tho a 21st century retcon gave him the Apache name "Dazii". Whatever his name might have been, he first appeared as the cover-featured star of Marvel Comics' Two Gun Western #5 (November, 1950). 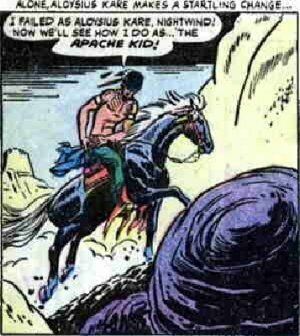 There, the name on his logo was "Apache Kid", and his was the only series in that issue. The story was drawn by John Buscema (The Avengers, Silver Surfer), but, as is often the case with pre-1960s comic books, its writing credit is unknown. The following month, he moved out into his own title (while still retaining his spot in Two Gun Western, which lasted until 1952, tho he shared later issues with Kid Colt, The Black Rider and others. The first issue of the new series was "#53" — #s 50-52 had been Reno Browne, Hollywood's Greatest Cowgirl; and before that it was Margie Comics (no relation). With the second issue, it switched to regular numbering, starting with #2. The most frequently-seen artist in the early issues was Werner Roth, who co-created Lorna the Jungle Girl but is best known for having drawn X-Men for several years during the following decade. The Apache Kid also appeared in the anthology title Wild Western during 1951 and '52. He shared it with other heroes such as The Two-Gun Kid and The Ringo Kid. But after 1952, he was only in his own comic. That title lasted until #19 (April, 1956). Then he was forgotten for years, just like The Kid from Dodge City, Blaze Carson and most of the company's other western stars of the '50s. In the early 1970s, many of his stories were reprinted in Western Gunfighters, which starred The Ghost Rider. This was followed by more years of oblivion. In more recent years, Marvel has made a minor attempt to revise its old western characters, making them more realistic — tho why they should single out that genre for a treatment they never gave to any other isn't clear. As part of this process, in 2002 the company published Apache Skies, where, among other things, he got his Apache name, "Dazii". Aloysius, Alan, or whatever his name was, he was killed off, and his daughter, by a halfbreed woman named Rosa, became the new Apache Kid. Even when they don't seem to have any value, and even when they go back more than half a century, Marvel will create a new character rather than let an old trademark lapse. Text ©2007-08 Donald D. Markstein. Art: © Marvel Comics.